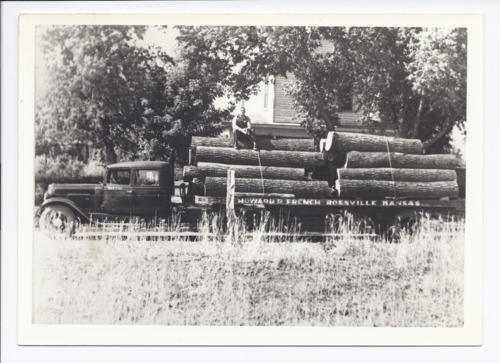 The first trucking business in Rossville, Kansas, was Howard French (pictured on top of logs) who started his business in 1929 and continued operation until 1946. His truck line mostly hauled livestock, feed, and freight. This photograph is provided through a pilot project to host unique cultural heritage materials from local libraries on Kansas Memory and was accomplished by mutual agreement between the Northeast Kansas Library System, the Rossville Community Library, and the Kansas Historical Society.